NASA's Great Observatories are teaming up to look deeper into the universe than ever before. With a boost from natural "zoom lenses" found in space, they should be able to uncover galaxies that are as much as 100 times fainter than what the Hubble, Spitzer, and Chandra space telescopes can typically see. This ambitious collaborative program is called The Frontier Fields. Astronomers will spend the next three years peering at six massive clusters of galaxies. Researchers are interested not only as to what's inside the clusters, but also what's behind them. The gravitational fields of the clusters brighten and magnify distant background galaxies that are so faint they would otherwise be unobservable. The clusters themselves are among the most massive assemblages of matter known. Astronomers anticipate that these observations will reveal populations of never-before-seen galaxies that existed when the universe was only a few hundred million years old. The Hubble and Spitzer data will be combined to measure the galaxies' distances and masses more accurately than either observatory could measure alone, demonstrating the synergy of these Great Observatories for such studies. The Chandra X-ray Observatory will also peer deep into the fields, imaging them at X-ray wavelengths to help determine the masses and lensing power of the clusters, as well as identify background galaxies with massive black holes. "The idea is to use nature's natural telescopes in combination with the Great Observatories to look much deeper than before and find the most distant and faint galaxies we can possibly see," said principal investigator Jennifer Lotz of the Space Telescope Science Institute (STScI) in Baltimore, Md. "We want to understand when and how the first stars and galaxies formed in the universe, and each Great Observatory gives us a different piece of the puzzle. Hubble tells you which galaxies to look at and how many stars are being born in those systems. Spitzer tells you how old the galaxy is and how many stars have formed," said Peter Capak, the Spitzer principal investigator of the Frontier Fields program. 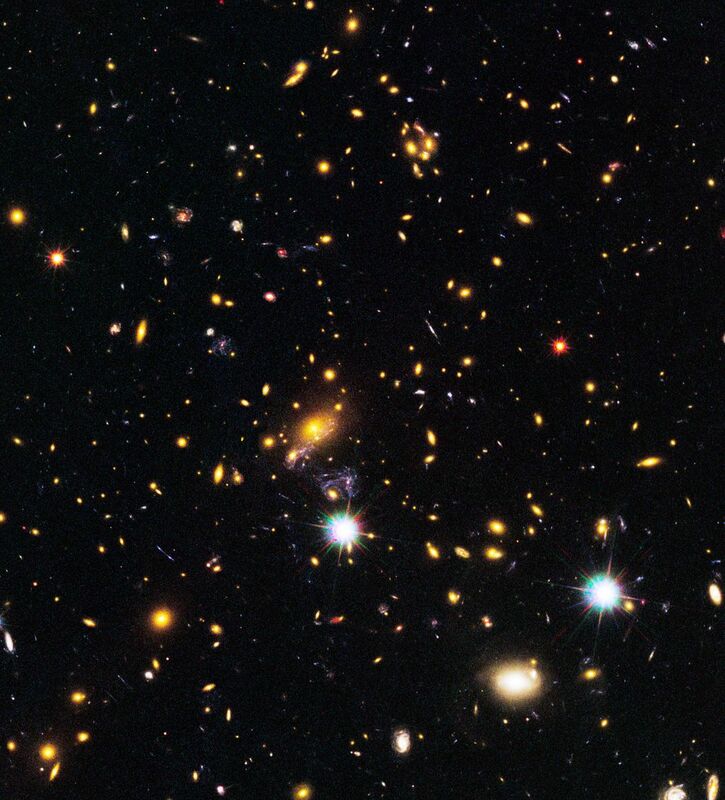 The high-resolution Hubble data from the Frontier Fields program will also be used to trace the distribution of dark matter within the foreground clusters. Accounting for the bulk of the universe's mass, dark matter is the underlying, invisible scaffolding attached to galaxies. "The apparent positions of those lensed galaxies then tell you what's happening with the cluster itself, where the dark matter is in that cluster," Lotz said. "We'll use that information to make a better model of the cluster to better understand its lensing power." The Hubble and Spitzer observations will be much more challenging for researchers than previous deep fields that have been studied by this powerful pair of observatories with great success. "With a deep image, you've got a direct image — what you see is what you get. But when we use a gravitational lens, background galaxies appear distorted and brighter," Lotz said. "In order to understand the true properties of a background galaxy, you have to understand how it is distorted and how it is magnified. This depends on the distribution of dark matter in the gravitational lens — the foreground cluster."